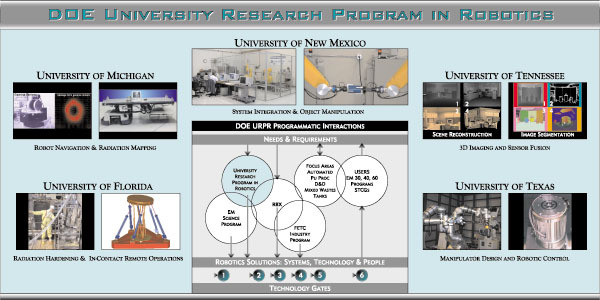 The University of New Mexico (UNM) has been developing a cycle-time reduction system for cleanup and remediation of hazardous waste sites, as well as for advanced manufacturing and forensics needs, with DOE. We call the system the Robotics and Automation Design-and-Drive System, or RADDS. The goal of the RADDS is to reduce the amount of time between a site-defined need and a site-delivered turnkey implementation of the robotic and/or automation hardware that solves the problem. 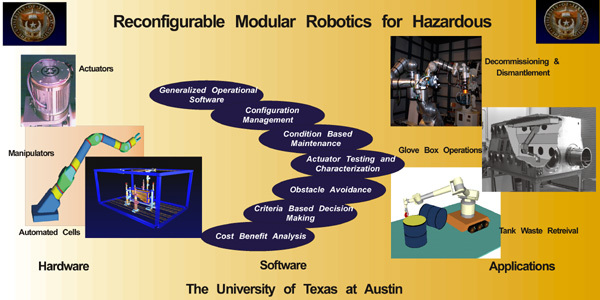 The RADDS, as a design and analysis tool, uses simulation to populate the solution with easily changeable models of robots, grippers, sensors, controllers, conveyors, tool changers, and other components to meet the requirements of the application. The preferred system, in simulation, can then be ordered and the simulation software can be directly converted to operate the actual hardware when it arrives. The open-architecture, Windows-based RADDS simulates the overall performance of the system. The user can easily change robots, grippers, vision systems, control algorithms, sensors, or any other components in the current solution to attempt to find a more performance-effective and/or cost-effective solution. The electrical and mechanical interfaces between simulated components are modeled in accord with the physical interfaces between real components thereby performing a simulated system integration of both the mechanical and data linkages. The RADDS is then able to expediently transform the simulation commands into actual hardware operation via appropriately configured physical device drivers. The RADDS can thus be used to design, simulate, and then run a system configuration. 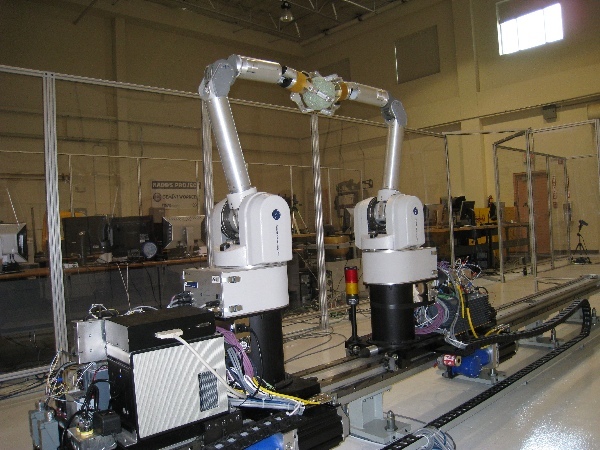 The RADDS is hierarchical, from machine (e.g., robot within a glovebox), to line (e.g., a series of automated glovebox units), to site levels (e.g., a complete material processing plant). The RADDS can also be used to train prospective personnel while the actual system is being built and delivered, to further shorten cycle times. In principle, the RADDS can provide site-level synthesis, control, and training from a laptop computer. In short, the RADDS is a modeling- and simulation-based design and analysis tool, that also serves as the operating system for the final (actual) system. 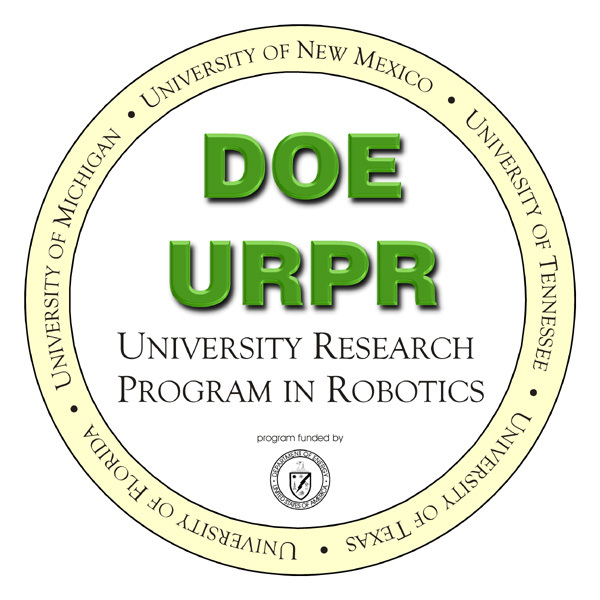 This work is supported by the Department of Energy (DOE), as part of its University Research Program in Robotics (URPR), a multi-university consortium consisting of the Universities of Florida, Michigan, New Mexico, Tennessee-Knoxville and Texas-Austin. The Principal Investigators at the University of New Mexico are Profs. J. Wood, R. Lumia and G. Starr.